The Ford Mustang debuted in 1965 as a simple sports car. It was named for the World War II Fighter Plane, The P-51 Mustang. Preliminary allusions, however, were made to the horse, and the horse motif quickly became the emblem of the Mustang. Buyers loved its low price, long hood, short trunk styling, and its Myriad of options. Lee Iacocca, then Ford’s general manager, is often credited with the development of the Mustang. Iacocca has long envisioned a small sports car to be the next hot item in the street wars. To do the competition one better, Ford introduced a whole new breed of sports car, The Pony Car. Plymouth faithful stress that their Barracuda beat the Ford Mustang to the market by two weeks. But it was the Mustang, racking up over one million sales in its first two years, that turned the market and people’s attention to the Pony Car. The Pony Car class that the Mustang helped create is the only class of muscle car that still exists today. 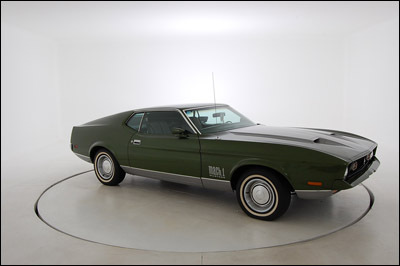 This high performance V-8 Mustang Mach 1 is from the Bob Swope Ford Collection.